The effects of future oil and natural gas development in southwestern Wyoming on wildlife populations are topical to conservation of the sagebrush steppe ecosystem. To aid in understanding these potential effects, the U.S. Geological Survey developed an Energy Footprint simulation model that forecasts the amount and pattern of energy development under different assumptions of development rates and well-drilling methods. The simulated disturbance patterns produced by the footprint model are used to assess the potential effects on wildlife habitat and populations. A goal of this modeling effort is to use measures of energy production (number of simulated wells), well-pad and road-surface disturbance, and potential effects on wildlife to identify build-out designs that minimize the physical and ecological footprint of energy development for different levels of energy production and development costs. 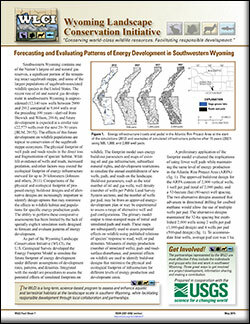 Garman, S.L., 2015, Forecasting and evaluating patterns of energy development in southwestern Wyoming: WLCI Fact Sheet 7, 2 p., https://pubs.usgs.gov/wlci/fs/7/.